What I know about music is dangerous. Actually, I know where Middle C is, how long a whole note is, and what a treble and base clef look like. Don't know much else. When I first came across Scott Houston doing one of his workshops on television, I thought I should really get his video or DVD (if there are such things) and start all over again and actually play - I've always wanted to play the piano properly but dreaded the thought of the tuition. 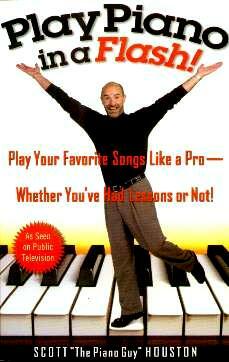 His show made it seem so effortless that I truly believed even I could be a "piano player". I enjoyed his upbeat mood and easy going approach and it looked as though it was possible to learn to play without the stress and strain. Tackling learning from a book baffles me somewhat, as I don't have a piano. Scott teaches us to read notes and to play the piano but insists this method is "NOT appropriate for use in playing classical-style piano". This method of teaching piano is so basic and so non-threatening, that those students who want to learn to read and play music without the years of scales and classical compositions to learn, should opt for this approach - you can always take it further should you turn out to be any good - so much less expensive and oh-so much less taxing on the brain. Scratch around your kids' toys and you might find a tiny piano - it'll be better than nothing if you don't have a real one. You'll learn how to read basic notes on the treble clef (they don't use the base clef, thankfully), chords, and a few other aspects. I must get the video as a back-up. If he's this easy to read and enjoy, making music can't be that far off. Throughout the book he's given the appropriate web address for more information. Go to his website for details. Conclusion - Highly recommended for those who want to play the piano but can't afford the time or money for formal lessons.